You’ll often hear the sale of Amazon’s first book, in 1995 cited as the beginning of the E-commerce timeline, but it actually has much humbler and older beginnings. Nevertheless, we have come a long way since that time. 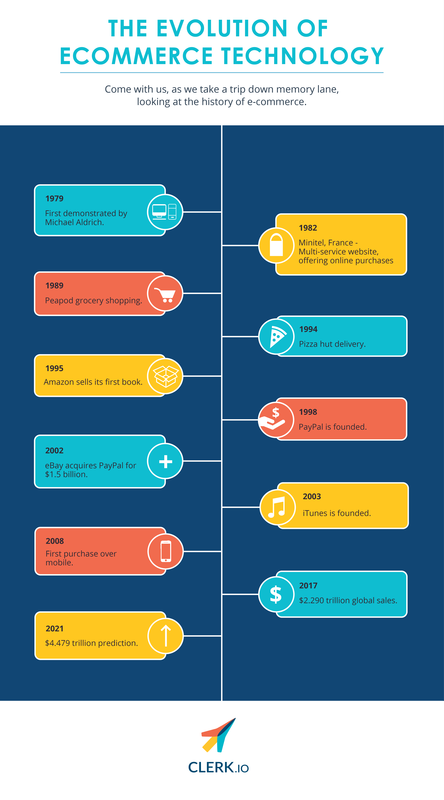 So, we're going to take a brief look at the history of e-commerce and take a few guesses about what’s in store for the future. Predictions are sourced from E-marketer and are projected for world-wide retail-worth in 2021. Although the roots of E-commerce lie over four decades ago, it’s more than likely that if you were to ask anyone from that time if they were buying their shoulder-padded power-suits or ingredients for a shrimp cocktail online, they would look at you with a confused face. These days you would be more hard-pressed to find a computer-user that hasn’t used online shopping, at least once. And that’s simply because, whilst the first two decades of the timeline were about establishing e-commerce and its necessary proponents, the more recent two decades have been about improving usability and becoming omnipresent. E-commerce has become about being more and more convenient, as a response to consumer behaviour. We have moved from having one computer per household (if we were lucky), to having palm-sized versions in our pockets. The digital transformation has taken us from having a basic user interface on a black and green screen, to interactive e-tailors offering services like a real-life shop clerk. With that in mind, a smaller timeline of trends, shows that from 2000 onwards, the evolution of e-commerce has been about improving and refining the experience for both customer and vendor. For more on these milestones you can click here. Whilst we may not have crystal balls to see what the future holds, we can look back and see that we already come leaps and bounds in a short time. Whatever the future holds, it is important to remain relevant, innovative and on top. As the head of the French Data Network said of Minitel in 2012, “Minitel innovated from 1978 to 1982, and then it stopped”. This led to its demise in an ever changing landscape of consumer behaviour, and it is a lesson we can all learn from. We for one are excited to see what’s in store.